Jamilla graduated from Texas A&M University in 2003 with a Bachelor of Science degree in Computer Engineering-Electrical Track and a Business Administration Minor. Jamilla worked as a Guidance and Navigation Engineer with United Space Alliance (USA) from 2003 through 2006. USA is NASA’s primary industry partner in human space operations, including the Space Shuttle and the International Space Station. Her job responsibilities at USA included testing and resolution of shuttle hardware and software anomalies within the Shuttle Avionics and Integration Laboratory. 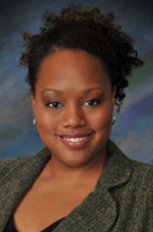 Jamilla earned her JD from the University of Houston Law Center in 2008. While attending law school, Jamilla served as an Articles Editor for the Houston Journal of Health Law and Policy. Jamilla passed the Patent Bar and the Texas Bar in 2008. She began her career as a patent attorney with a mid-sized Houston law firm in that same year. Jamilla’s practice has given her experience in a wide variety of technical fields such as oil and gas downhole tools, oil and gas simulation and visualization technologies, computer software, and database systems. She is a member of the Society of Petroleum Engineers.